Inspired by her early training as an architect in Belgrade, London-based fashion designer Roksanda Illincic has always maintained an interest in industrial fabrications. From dresses embroidered with PVC thread and plastic confetti, to undulating silhouettes inspired by the sculptures of Julia Dault, plastic-focused flourishes are a signature of her bright and colour-blocked designs. Further expanding her growing accessories line, the designer has now experimented with bold acetate on a debut range of sunglasses, created in collaboration with luxury optical brand Cutler and Gross. Illincic explored the extensive Cutler and Gross archive during her design process. ‘The collection was inspired by vintage frames and modernist shapes,’ she says of the six oversized styles in unusual colourways, like emerald green and mustard yellow, and tortoiseshell and peach. ‘The combinations are off beat and often unexpected which is a natural extension of my ready to wear line, as with my collections,’ Illincic adds. Placing focus on the playfulness of transparent plastics, Illincic used Italian acetate for both the temples and frontals of her handmade designs. ‘Roksanda’s interest in architecture and structure informed the choice of sheer colour, which allowed the metal wire core to be visible,’ explains Marie Wilkinson, the design director of Cutler and Gross. Illincic also looked to the London-based contemporary art collective Troika for design inspiration. Interested in spatial experience and human perception, Troika’s installations include Dark Matter (2014), an opaque hanging sculpture that resembles a square, circle or a hexagon depending on your vantage point; and All Colours White (2016), a painting made of light, which rotates from a band of white to a kaleidoscopic spectrum of colours. Illincic’s own designs play with such perceptions. 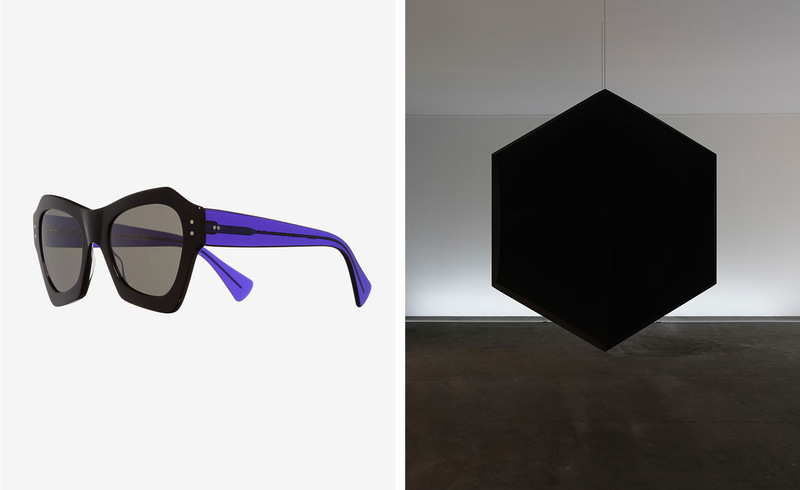 One design features black hexagonal frontals and midnight blue temples, a colour only visible when the frames are viewed from an angle. ‘The shapes are about allowing women to wear the beauty found in design, in a subversive way,’ Illincic explains.